Most pumps depend on the water being pumped for seal lubrication and impeller protection, and pressure pumps are controlled by a pressure switch that relies on the presence of water to deliver flow and pressure. When an interruption to the supply of water occurs, none of these functions work as intended, and if left undetected the pump is likely to run continuously, resulting in drained batteries, pump damage, or both. Made in the USA, patented NOFLOTM is standard equipment on PARAGONTM Junior, PARAGONTM Senior and PARALLELAGONTM pumps. It will recognize an interruption to the flow of water to your pump of greater than 30-seconds duration, and safely shut off the pump. There are no moving parts or probes into the water path, and NOFLOTM works with any pump type (centrifugal, vane, rotary, etc. ), or material (bronze, stainless steel, plastic, etc.). The conductivity of water is utilized to recognize the presence or absence of water. The control translates the information received from the NOFLOTM sensor, and either permits the pump to run, or disables it. In the event of a shutdown, pump operation is not automatically re-started, but may be resumed only after the cause for the interruption of flow has been resolved, and the control reset by briefly interrupting power at the breaker panel. 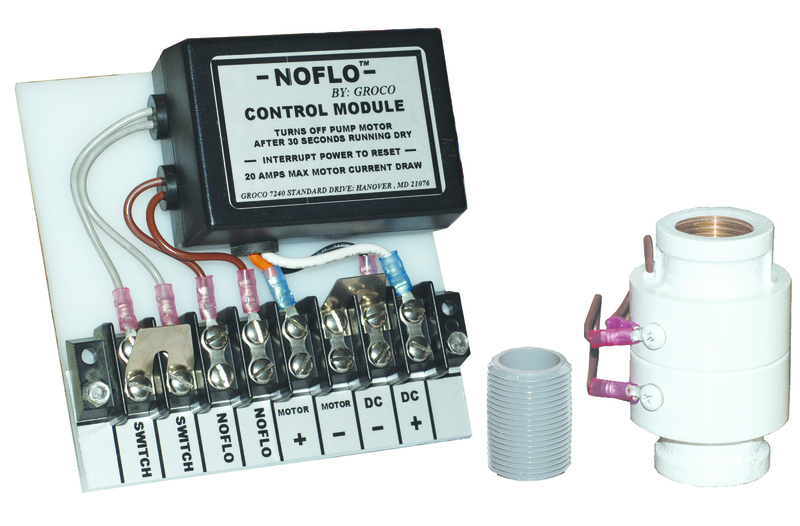 The NOFLOTM control module operates on any DC input from 12V to 32V, and has an internal relay that will provide power to a DC pump motor (20 amps max@12VDC). AC pumps require an additional relay or solenoid. 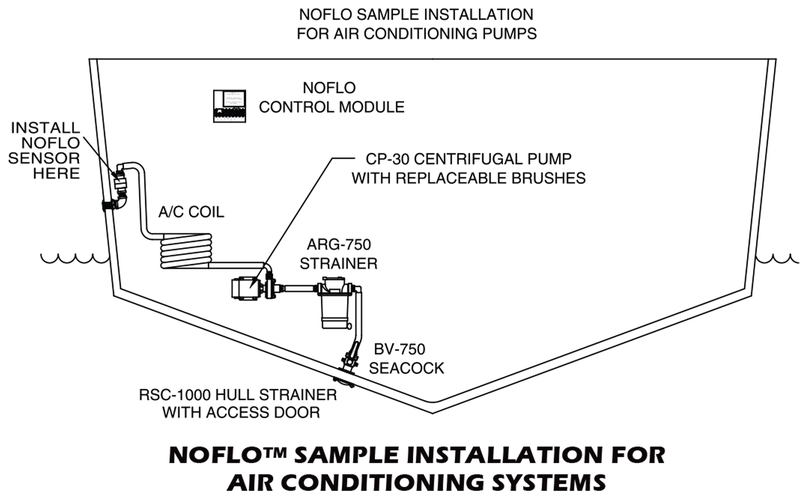 NOFLOTM may be used with or without external pump control (pressure switch or on-off switch). Maximum water temperature is 240 deg F.